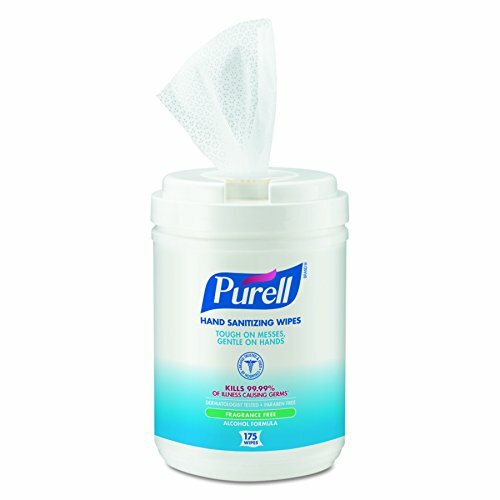 PURELL alcohol formulation sanitizing wipes are antimicrobial premoistened hand wipes with 62% ethyl alcohol to help reduce the number of germs on hands and remove light soils; and they come in a plastic canister that keeps moisture in while a pop-up dispenser allows wipe extraction. These textured wipes are lint-free to leave hands clean, and contain no fragrance or dye. GOJO Industries manufactures hygiene products, including hand washing, hand sanitizing, and skin care formulas under the GOJO, PURELL, PROVON, MICRELL, and AQUELL brands. The company, founded in 1946, is headquartered in Akron, OH. DUAL PURPOSE: Skin friendly wipes are gentle to clean and sanitize hands and faces while also tough on messes and spills. SKIN FRIENDLY: Pre-Moistened Wipes are dermatologist tested and contain skin conditioners to protect skin from dryness without leaving a sticky residue. PORTABLE: Purell wipe canisters can be used in several locations including office break rooms, health clubs, schools, physician offices, nursing stations, mobile healthcare units, construction vehicles and grocery stores.